The annual global climate summit came to end over the weekend, with participating nations agreeing to several new conditions in their bid to curb greenhouse gas emissions. The 24th conference of the parties — otherwise known as COP24 — concluded after two weeks of negotiation in Katowice, Poland. Around 25,000 delegates from nearly 200 countries participated in the summit. As is the case every year, delegates were tasked with how to fight against climate change and reduce the world’s carbon emissions. A key part of this goal includes how to best implement the 2015 Paris climate agreement. The biggest change to come out of COP24 is the establishment of a “rule book” that participating nations will use to report their greenhouse gas emissions and funding efforts. Additionally, the rules will allow countries to monitor the carbon reduction efforts of other governments. The U.S. expressed some pleasure over the new agreement, believing it will force other countries to be held more accountable for their carbon emissions. The U.S. has decried China — the world’s second largest economy — for being the world’s largest polluter, but never seemingly facing the same level of repercussions. “The outcome took a significant step toward holding our economic competitors accountable for reporting their emissions in a manner consistent with standards the United States has met since 1992,” read a Saturday statement from the U.S. Department of State. The Trump administration made its opposition to the Paris climate agreement clear, but cannot officially withdraw until 2020. In the meantime, the White House sends delegates to participate in climate change talks. The U.S. was notable in that it hosted a pro-fossil fuel forum during the summit in 2018. While COP24 ended with encouragement for countries to do more in the fight against global warming, nothing from the two week-long summit is binding. The lack of any major breakthroughs attracted criticism. 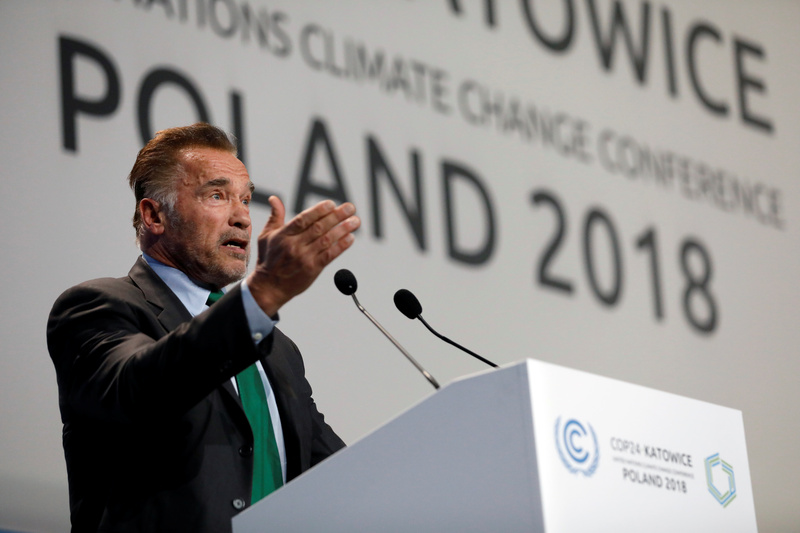 Actor Arnold Schwarzenegger speaks during the COP24 UN Climate Change Conference 2018 in Katowice, Poland December 3, 2018. REUTERS/Kacper Pempel. The global climate summit came after a comprehensive report from the United Nations claimed quick and drastic action is necessary to reduce the world’s greenhouse gas emissions, or else face catastrophe.